Unfortunately, I had other things that needed my attention this month as well: my shoulder has been giving me issues lately, so I’ve been juggling orthopedist appointments and twice-weekly occupational therapy sessions into my schedule. There are a couple of templates in a post below this one for the first-ever PixelScrapper CU Blog Train (“Bath Time”), as well. I also spent some time helping out the incursion community within EVE Online–we put on an event last weekend in-game for charity, and I’d love to talk for a minute about it. Even with all that going on, though, I’ve still got a pack of cards for you. Just click the image to download. I ended up with WAY more card templates than I’d intended to make, so I’ve added two new packs to the shop–appropriately enough, entitled “Blue Skies” and “Lemonade Dreams”. 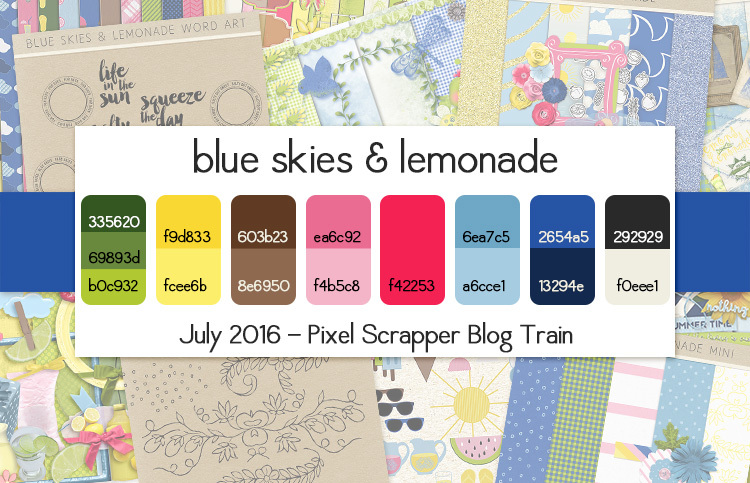 Blue Skies is all about the cheerful vibe, while Lemonade Dreams brings in more citrus punch. Both are priced at $1.99 each, should you decide you need them in your stash. I usually do a blog freebie when I release something in the shop, and this time is no exception. I’ve got a set of finished cards made from the Lemonade Dreams templates here for you. These are flattened, but if you simply wish to use them as cards in your layouts rather than using them as templates, they’ll do nicely. Click the image to download! Once you’re done here, don’t forget to head back to the main thread at PixelScrapper to download all the other fantastic stops on this month’s train! Thank You for the fun cards !!! Thank you so much for the lovely cards & templates. And Care for Kids sounds amazing – what a great way to help & entertain long-term hospitalized teens! Sounds like things have been more than a little crazy for you. Thank you for taking the time to make these wonderful journal cards for us! They are so pretty!! Thank you so much for sharing!!! Thanks for sharing your beautiful work!! Much appreciated 🙂 Hope your shoulder issues have settled down a little!! Thanks a lot for the lovely share and the extra freebie too! Thanks for the lovely cards! I love! journal cards … and these are e-special-ly sweet! Thank-you so much.